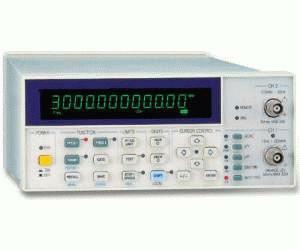 The model FD-853 is an RF Frequency Counter designed for system and bench use with max 9 digits resolution, featuring RS-232C and GPIB interfaces with full remote control capability. The frequency range is from 10 Hz to 3 GHz and high resolution measurements are possible. It is also equipped with the measurement functions for period and peak voltage with auto trigger and auto limiting testing. The model FD-853 is designed for use in R&D and production lines such as cellular phone, personal radios, and other communication products.